BRITISH STANDARD BS 7579:1992 ISO 2194:1991 Specification for Designation and nominal sizes of openings for woven wire cloth, perforated plate and electroformed sheet for industrial screensBS7579:1992 This British Standard, having been prepared under the directionof the General Mechanical Engineering Standards Policy Committee,waspublished underthe authorityof the StandardsBoardand comesintoeffect on 15May1992 © BSI 10-1999 The following BSI references relate to the work on this standard: Committee reference GME/28 Draft for comment 90/76585 DC ISBN 0 580 20883 4 Committees responsible for this British Standard The preparation of this British Standard was entrusted by the General Mechanical Engineering Standards Policy Committee (GME/-) to Technical Committee GME/28, upon which the following bodies were represented: BCIRA British Cement Association British Coal Corporation British Laboratory Ware Association Coated Abrasives Manufacturers’ Association Guild of Metal Performance Institution of Chemical Engineers Institution of Mining and Metallurgy Mechanical Handling Engineers Association Ministry of Defence NABIM Society of Chemical Industry Society of Cosmetic Scientists Woven Wire Association The following bodies were also represented in the drafting of the standard, through subcommittees and panels: British Aggregate Construction Materials Industries British Steel Industry British Industry (Wire Section) National Federation of Clay Industries Ltd. Refractories Association of Great Britain Amendments issued since publication Amd. No. Date CommentsBS7579:1992 © BSI 10-1999 i Contents Page Committees responsible Inside front cover National foreword ii Introduction 1 1 Scope 1 2 Normative reference 1 3 Definitions 1 4 Designation 1 5 Nominal sizes of openings 1 Annex A (informative) Bibliography 4 Table 1 — Nominal sizes of openings — Millimetre sizes 2 Table 2 — Nominal sizes of openings — Micrometre sizes 3 List of references Inside back coverBS7579:1992 ii © BSI 10-1999 National foreword This British Standard has been prepared under the direction of the General Mechanical Engineering Standards Policy Committee. It is identical with ISO2194:1991 Industrial screens — Woven wire cloth, perforated plate and electroformed sheet — Designation and nominal sizes of openings, published by the International Organization for Standardization (ISO) and prepared by Technical Committee ISO/TC24, Sieves, sieving and other sizing methods, subcommittee SC3, industrial wire screens. ISO2194 was produced as a result of international discussions in which the UK took an active part. Cross-references The Technical Committee has reviewed the provisions of ISO9045:1990 to which normative reference is made in the text, and has decided that they are acceptable for use in conjunction with this standard. A British Standard does not purport to include all the necessary provisions of a contract. Users of British Standards are responsible for their correct application. Compliance with a British Standard does not of itself confer immunity from legal obligations. Summary of pages This document comprises a front cover, an inside front cover, pages i and ii, pages1 to 4, an inside back cover and a back cover. This standard has been updated (see copyright date) and may have had amendments incorporated. This will be indicated in the amendment table on the inside front cover.BS7579:1992 © BSI 10-1999 1 Introduction The nominal sizes of openings specified in this International Standard are taken from the R10, R20 and R40 series of preferred numbers in accordance with ISO3 and from the R‰10, R‰20 and R‰40 series of rounded values in accordance with ISO497. The sizes within each series follow a geometric progression. Therefore, each size of a series differs from the successive size by a constant percentage. Apart from the omission of a few unusual values in the range of the very small sizes, the ratios of the successive sizes are as follows. 1 Scope This International Standard specifies the designation and nominal sizes of openings for woven wire cloth, perforated plate and electroformed sheet used as screening media for industrial purposes. 2 Normative reference The following standard contains provisions which, through reference in this text, constitute provisions of this International Standard. At the time of publication, the edition indicated was valid. All standards are subject to revision, and parties to agreements based on this International Standard are encouraged to investigate the possibility of applying the most recent edition of the standard indicated below. Members of IEC and ISO maintain registers of currently valid International Standards. 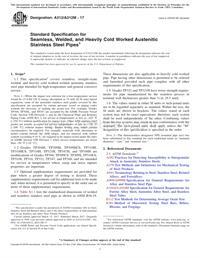 ISO 9045:1990, Industrial screens and screening — Vocabulary. 3 Definitions For the purposes of this International Standard, the definitions given in ISO9045 apply. 4 Designation 4.1 General Nominal sizes of openings of1mm and above shall be expressed in millimetres (mm); sizes below1mm shall be expressed in micrometres (4m). 4.2 Woven wire cloth Woven wire cloth shall be designated by the nominal size of the apertures w, the type of weave, and the nominal diameter d and the material of the wire. 4.3 Perforated plate Perforated plate shall be designated by the nominal size of the holes w (central separation of opposite sides or diameter), the shape of the holes (square, circular or any other regular geometric shape), and by the nominal thickness and the material of the plate. 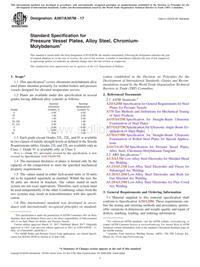 It is recommended that the codification of perforations in accordance with ISO7806 be used. 4.4 Electroformed sheet Electroformed sheet shall be designated by the nominal size of the apertures w, the shape of the apertures (square or circular) and the denomination “electroformed”. 5 Nominal sizes of openings Three series of nominal sizes of openings are specified (seeTable 1 andTable 2). The R 10 (R‰10) sizes shall be chosen by preference; otherwise the R20 (R‰20) sizes and, if necessary, theR40 (R‰40) sizes may be chosen. NOTE 1Attention is drawn to the fact that any two consecutive sizes of the R40 series may overlap when the tolerances for industrial woven wire cloth apertures given in ISO9044 are taken into account. Series ISO 3 Step Ratio R 10 R 20 R 40 about 25 % about 12 % about 6 % 1,25 1,12 1,06BS7579:1992 2 © BSI 10-1999 Table 1 — Nominal sizes of openings — Millimetre sizes Principal sizes Supplementary sizes Principal sizes Supplementary sizes R 10 R 20 R 40 R 10 R 20 R 40 125 125 125 4,25 118 4 4 4 112 112 3,75 106 3,55 3,55 100 100 100 3,35 95 3,15 3,15 3,15 90 90 3 85 2,8 2,8 80 80 80 2,65 75 2,5 2,5 2,5 71 71 2,36 67 2,24 2,24 63 63 63 2,12 60 2 2 2 56 56 1,9 53 1,8 1,8 50 50 50 1,7 47,5 1,6 1,6 1,6 45 45 1,5 42,5 1,4 1,4 40 40 40 1,32 37,5 1,25 1,25 1,25 35,5 35,5 1,18 33,5 1,12 1,12 31,5 31,5 31,5 1,06 30 1 1 1 28 28 26,5 25 25 25 23,6 22,4 22,4 21,2 20 20 20 19 18 18 17 16 16 16 15 14 14 13,2 12,5 12,5 12,5 11,8 11,2 11,2 10,6 10 10 10 9,5 9 9 8,5 8 8 8 7,5 7,1 7,1 6,7 6,3 6,3 6,3 6 5,6 5,6 5,3 5 5 5 4,75 4,5 4,5BS7579:1992 © BSI 10-1999 3 Table 2 — Nominal sizes of openings — Micrometre sizes Principal sizes Supplementary sizes Principal sizes Supplementary sizes R 10 R 20 R 40 R‰10 R‰20 R‰40 950 48 900 900 45 45 850 42 800 800 800 40 40 40 750 38 710 710 36 36 670 34 630 630 630 32 32 32 600 25 25 560 560 20 20 530 16 500 500 500 10 475 5 450 450 425 400 400 400 375 355 355 335 315 315 315 300 280 280 265 250 250 250 236 224 224 212 200 200 200 190 180 180 170 160 160 160 150 140 140 132 125 125 125 118 112 112 106 100 100 100 95 90 90 85 80 80 80 75 71 71 67 63 63 63 60 56 56 53 50 50 50BS7579:1992 4 © BSI 10-1999 Annex A (informative) Bibliography  ISO 3:1973, Preferred numbers — Series of preferred numbers. ISO 497:1973, Guide to the choice of series of preferred numbers and of series containing more rounded values of preferred numbers. ISO 7806:1983, Industrial plate screens — Codification for designating perforations. ISO 9044:1990, Industrial woven wire cloth — Technical requirements and testing.BS7579:1992 © BSI 10-1999 List of references See national foreword.BS 7579:1992 ISO 2194:1991 BSI 389 Chiswick High Road London W4 4AL BSI—BritishStandardsInstitution BSI is the independent national body responsible for preparing BritishStandards. It presents the UK view on standards in Europe and at the international level. It is incorporated by Royal Charter. Revisions BritishStandards are updated by amendment or revision. Users of BritishStandards should make sure that they possess the latest amendments or editions. It is the constant aim of BSI to improve the quality of our products and services. We would be grateful if anyone finding an inaccuracy or ambiguity while using this BritishStandard would inform the Secretary of the technical committee responsible, the identity of which can be found on the inside front cover. Tel:02089969000. Fax:02089967400. BSI offers members an individual updating service called PLUS which ensures that subscribers automatically receive the latest editions of standards. Buying standards Orders for all BSI, international and foreign standards publications should be addressed to Customer Services. Tel:02089969001. Fax:02089967001. In response to orders for international standards, it is BSI policy to supply the BSI implementation of those that have been published as BritishStandards, unless otherwise requested. Information on standards BSI provides a wide range of information on national, European and international standards through its Library and its Technical Help to Exporters Service. Various BSI electronic information services are also available which give details on all its products and services. Contact the Information Centre. Tel:02089967111. Fax:02089967048. Subscribing members of BSI are kept up to date with standards developments and receive substantial discounts on the purchase price of standards. For details of these and other benefits contact Membership Administration. Tel:02089967002. Fax:02089967001. Copyright Copyright subsists in all BSI publications. BSI also holds the copyright, in the UK, of the publications of the international standardization bodies. Except as permitted under the Copyright, Designs and Patents Act 1988 no extract may be reproduced, stored in a retrieval system or transmitted in any form or by any means – electronic, photocopying, recording or otherwise – without prior written permission from BSI. This does not preclude the free use, in the course of implementing the standard, of necessary details such as symbols, and size, type or grade designations. If these details are to be used for any other purpose than implementation then the prior written permission of BSI must be obtained. If permission is granted, the terms may include royalty payments or a licensing agreement. Details and advice can be obtained from the Copyright Manager. Tel:02089967070.